The journal publishes original research papers of high scientific quality in two areas: Mathematical Modelling, and Numerical Analysis. 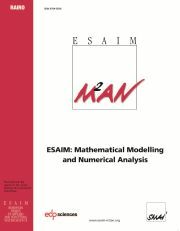 Mathematical Modelling comprises the development and study - e.g. structure, well-posedness, solution properties - of a mathematical formulation of a problem (or class of problems). Numerical Analysis comprises the formulation and study - e.g. stability, convergence, computational complexity - of a numerical approximation or solution approach to a mathematically formulated problem (or class of problems). Papers submitted to ESAIM: M2AN should satisfy two additional criteria. First, papers should focus on mathematical models or numerical methods germane to current research topics and applications. Second, papers should be of interest to researchers and practitioners that value both rigorous theoretical analysis and solid evidence of computational relevance. Applications may be drawn from the broad range of physical, life, and social sciences, and the many engineering disciplines.